In our everyday work and personal life, we often come across the term ‘Emotional Intelligence’. 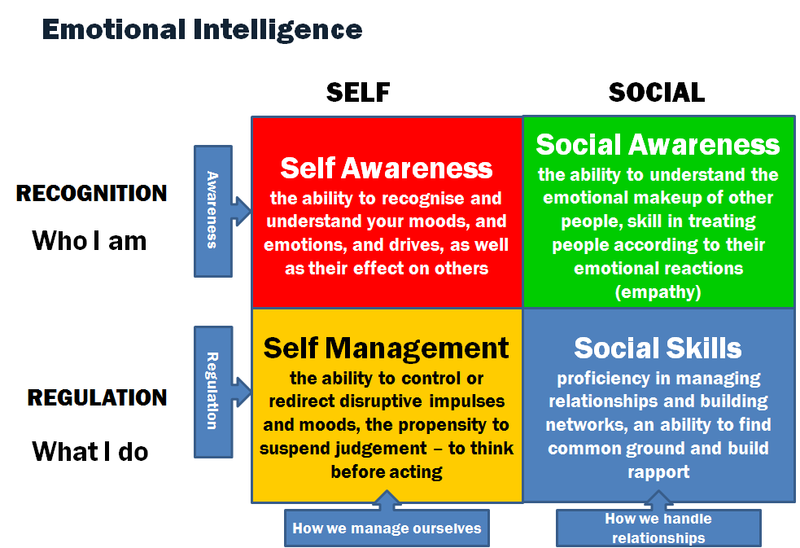 But what is Emotional Intelligence (EI) and how can you improve it? Emotional Intelligence is the ability to identify, understand and manage emotions – the ability to manage ourselves and our relationships effectively. The term EI has been around since the 1980s, and was popularised by Daniel Goleman in the mid-1990’s when he published a book of the same name. There has been much research by him, and others in the years since, with many books, articles and instruments published, expanding our understanding of EI and the importance it has both in the workplace, and in the wider facets of our lives. (Click here to access some recent blogs, videos, and development materials by Daniel Goleman). If you have high emotional intelligence, it means that you can recognise your own emotional state and the emotional states of others, and engage positively with people in a way that draws them to you and strengthen relationships. This can be an advantage in your professional life, but of course can help you form healthier relationships in all aspects of your life. Importantly, most experts in EI do not believe EI competences are innate talents, but learned abilities. This means everyone has the ability to increase their EI, if they work on building the skills and capabilities. What are the four EI dimensions? There are four dimensions of Emotional Intelligence : two that relate to how we manage ourselves, and two that relate to how we handle relationships. Splicing the model the other way, two dimensions relate to recognition or awareness, and two relate to what we do – how we manage ourselves or relationships. What can I do to improve my EI (EQ)? We have created a summary of the EI model, developed a simple self assessment tool, and identified some practical tips to help you improve your emotional intelligence. We have developed a suite of 2-3 half day workshops to explore ways to develop your Emotional Intelligence. Contact us if you are interested in finding out more about these workshops. ← Empathy – the most important leadership trait today?